Mr. Quincy Jones will make a guest appearance for the 2006 ACM Computers in Entertainment Scholarship Awards Reception co-sponsored by the American Film Institute on November 4, 2006. On November 4th at the American Film Institute, Mr. Quincy Jones, Prof. Adrian David Cheok, and Editor-in-Chief Newton Lee will present the 2006 ACM Computers in Entertainment Annual Scholarship Awards to three outstanding students who have won the research paper competition. The 2006 Annual Scholarship Awards Reception is co-sponsored by the American Film Institute (AFI) and organized by the Institute for Education, Research, and Scholarships (IFERS) in association with ACM (Association for Computing Machinery) and ACM Computers in Entertainment. 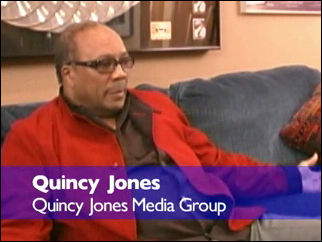 Mr. Quincy Jones has been an editorial board member of ACM Computers in Entertainment since 2003. A video interview of Quincy appeared in the January/March 2004 issue online at the ACM Computers in Entertainment magazine. The nonprofit publication promotes education in entertainment technology including computer games, movies, and music. Three outstanding students from the UK and Finland will be awarded the $15,000 scholarships sponsored by the National University of Singapore Mixed Reality Lab. Event tickets are on sale now for $50 (professionals), $45 (ACM / AFI members), and $25 (students) at http://www.acm.org/pubs/cie/scholarships.html All proceeds go to benefit the 2007 ACM Computers in Entertainment Annual Scholarships. Music entertainment will be provided by The Belles Of Bourbon Street (Jazz / Blues), Stig Mathisen (Guitarist), Merethe Mikkelsen (Vocalist), and Chris Murphy (Violinist and Composer). 1) Alan Kay is one of the earliest pioneers of object-oriented programming, personal computing, and graphical user interfaces. 2) A co-creator of the Xbox gaming platform at Microsoft, Seamus Blackley is an agent at the Creative Artists Agency (CAA). 3) Seymour Papert is considered the world's foremost expert on how technology can provide new ways for children to learn.